Yeheeee….I have a Geared Bike!!! 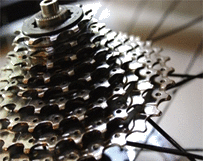 Cycles are available with many gear variations starting from single speed (gear) and can go up to 27 gears or more.These are the cogs on your rear wheel multiplied by number of front chain rings that a bike has, so let’s say you have a road bike which has 10 cogs on the rear wheel and two chain rings, it equates to 20 gears and if you have a bike which is with 7 cogs on the rear wheel and 3 Chain Rings you have 21 gears…WOW!! Chain rings and Rear gear Cogs are made up of teeth (which might vary from bike to bike), knowing their count and equating them will get us to a better understanding on gears on our cycles and also assist us in riding more efficiently. Rider will need to push harder on higher gears as compared to pedal more on lower gears. So what’s the right gear for me? Rider will need to figure out his/her ideal cadence/RPM which they can sustain for the length of their ride. This can be achieved by simply riding continuously at an effort where neither you have to push hard nor are pedaling as fast where you start bouncing on the saddle. Once you get into this effort zone you may want to count on the revolutions for may be 10 secs and multiple this by 6 to get to your one minute number (RPM - revolutions per minute). Many scientific studies have concluded that an average human will have a average cadence between 80-85 RPM. Many Elite and professional riders have been able to achieve 100 plus RPM as their ideal RPM. Surely these numbers come with systematic training, dedication and hard work over a period of time. Gear that allows you to sustain your ideal cadence and your desired effort (not speed) is just about right for you. You have gears and want to make best use of it so shift to appropriate gear to maintain your ideal/sustainable cadence on what ever the terrain is..